The Harmonia Living Urbana 5 Piece Outdoor Bar Set with Turquoise Sunbrella Cushions (SKU HL-URBN-CB-5BCS-SP) with Resin Wicker will add style to any back yard, balcony, or outdoor space. The set's compact, minimalist design can fit your guests into small areas without compromising its contemporary look. The table and four stools are covered in a modern, High-Density Polyethylene (HDPE) wicker infused with a coffee bean color and UV protection, designed to last despite harsh outdoor elements. Each piece is framed with powder-coated, thick-gauged aluminum for strength and excellent corrosion resistance. The seats feature additional reinforcement to prevent the resin wicker from stretching over the life of the stools. Conveniently, underneath each piece are plastic guides to let you slide the seats or rearrange this patio dining set freely without worrying about damage to your patio or deck. 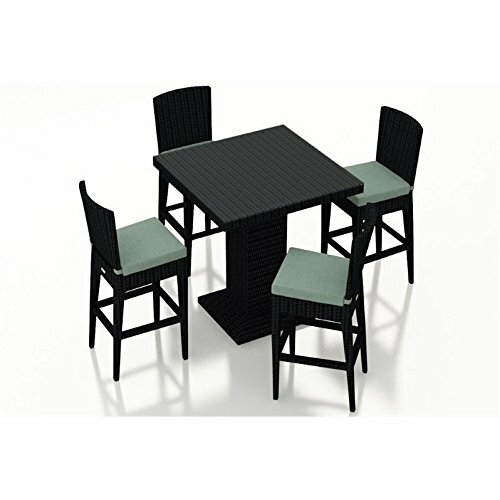 Bar Table: 31.5"W x 31.5"D x 41.12"H, Bar Chair: 17.5"W x 18"D x 43.25"H, Cushion Thickness: 2"